Who’s The Mystery iPhone Photographer At George Harrison’s Hollywood Walk Of Fame Ceremony? Who’s the guy on the top right wedged in between Olivia & Dhani Harrison taking a picture of Paul McCartney at George Harrison’s Hollywood Walk Of Fame Ceremony on April 14, 2009. Pan the photo out and it’s a star stuck Tom Hanks. I always find it funny to see that even the super famous actors get all giddy and can’t pass up on a photo op of a Beatle. 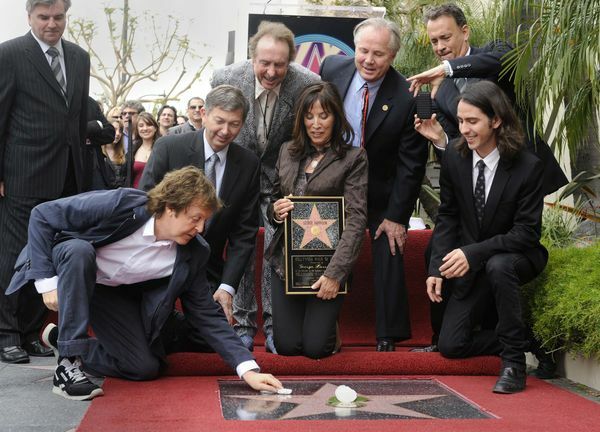 Two years later, Paul McCartney finally got his star in Hollywood. 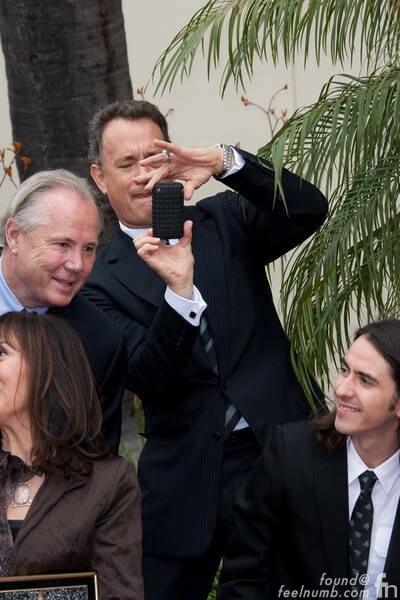 OMG… I don’t even know if Tom Hanks was actually AWARE what Paul was doing and why it was worth snapping a photo over. BUT, his moment is sure perfect! This is actually an unlikely poignant moment to those who knows! After the star was unveiled by Olivia and Dhani, Olivia touched the name of George on that star with her light hand, and rubbed her forehead with the ‘dust’ off her late husbands name. That is a Hindu tradition of reference – rubbing the dust off the foot of a revered person (usually a Hindu priest, or a Holy person) on your forehead, as a means of anointing yourself with the dust of a Holy person (or perceived to be Holy). Dhani does the same thing a moment later, touching the name of his late father on that star. The next second you could see Paul tapping Olivia on her right shoulder, and leaned over towards her, seeming whispering to her. You would see the next second, that Olivia nodded her head. And before you know it, you see Paul stepped forward from his previous position, behind the third person, to the right of Olivia, and kneels on George’s Hollywood star and started wiping it with his white handkerchief, right on George’s first name! That is the scene you see on this two photos. 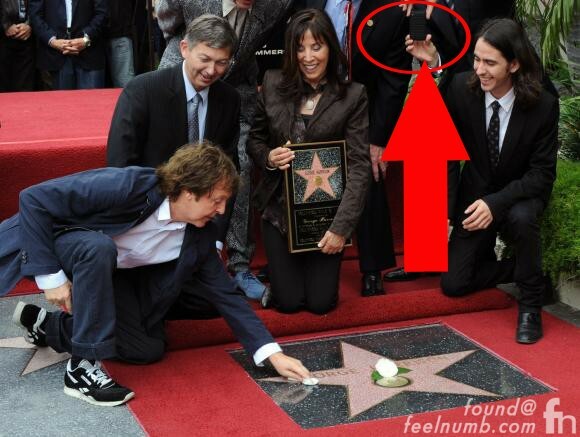 Paul was showing his respect towards his Beatle Brother in his own way – recognizing that Olivia and Dhani just ‘anointed’ themselves with the dust off George’s Hollywood star in Hindu tradition. At the same time, he is not pretending that he bought into George’s Hindu faith, hence he invented his own way to demonstrate his love and affection for George while amusing Olivia and Dhani in process. That was the reason Olivia and Dhani were laughing in the first photo when Paul first wiped George’s name with his white handkerchief. And Tom Hanks was right on – this moment was indeed a Kodak moment. Here’s that video clip. Notice Paul rubbing Olivia on her right shoulder/arm on min. 0.26. And the rest of the scene follows.